Custom Magnetics | Custom Inductors & Transformers | Coil Winding Specialist Inc. Coil Winding Specialist Inc. (CWS) started in the early 1980s as the custom magnetics design company. Today CWS specializes in custom inductors, custom transformers, custom chokes and custom coils. Over the years, CWS has designed and manufactured thousands of types of customer specific designs of custom magnetics. This page shows some of the most common types of the custom inductors, custom transformers and custom cokes and coils designed and manufactured for CWS' customers. CWS engineers have over 50 years of combined experiences in designing custom magnetics. Please see Design Consulting for more information. Inductors such as common mode chokes and differential mode chokes needs to be customized for optimal performance in a circuit to combat EMI issues and interference with other circuits. This optimization is more critical in high speed circuits. 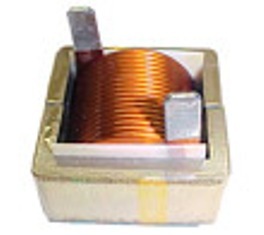 Inductors and Transformers are usually custom magnetics designed for specific requirements. This is because every electronic circuit is different, and the custom magnetics used in the circuit that includes the inductors and transformers are usually designed after the digital portion of the circuits are done. Also, inductors and transformers are analog devices in the mainly digital world. So, many design engineers trained in digital circuits are not experts in designing custom magnetics. This is why the expertise of CWS engineering comes in to assist these engineers to optimize their custom magnetics designs. CWS engineering does not need the design engineers to provide detailed drawings or detailed description of the requirements. We are able to design and built custom magnetics products based on basic information from the engineers so that the samples can be delivered speedily to run some benchmark testing first. Since magnetic is an analog device, usually a few iterations are needed to finalized the design. After the custom magnetics design is finalized, CWS will develop a detailed set of specifications with engineering drawings for our customers.